It’s a story where a man who exterminated pests continues to exterminate pests in another world. The novel starts with an interesting premise, an exterminator in a new world trying to apply his talents. However, it then takes the most predictable turn that most Japanese isekai stories take - he rapidly levels up and gains the attention of every girl around him. The writing is very simple, the enemies aren't creative, and the plot is not particularly compelling. This novel is getting harder to read as it progress. The MC is soo annoying. Having too much stats and not wanting to fight just because he doesent know how to fight. Its like I dont want to punch him because I dont know boxing and maybe I can lose even with my insanse level and stats. Is stupid anywhere you look at it. ... more>> Another Lazy MC that is a women magnet and and easy way weak to strong to op character. Is there Romance/Harem? Nope none don't get your hopes up, though there are many female characters (an obsessive slave, bikini armored battle junkie, regrettable monster researcher, big boobed sheep-girl) they are mostly just quirky characters no sign of romance whatsoever..
MC leveled-up way too fast as of ch56 he is already lvl95. He's pretty much OP but you'd rarely see him fight as he occasionally uses his tools to exterminate pests. So there is not much tension in the story. And as for the comedy there really isn't much or so to say I think there were times it tried to be funny but since it's overused it's not really that funny anymore. The MC is mostly carefree and does what he wants to do put it in a more positive tone he's in control of his life, but the downside of this is his lack of ambition. He is true to his occupation as an exterminator as he takes on jobs to exterminate pests. Now for the main plot which was suddenly revealed I think it was around chapter 50, the MC now is starting his own company as an exterminator. I didn't expect anything from this novel and I was right. 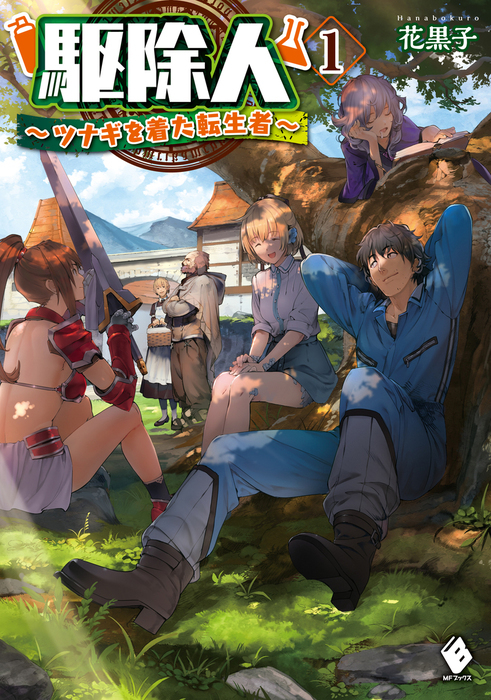 Unlike many isekai novel MC, this one is very carefree, but hard working ! Nice ? Yeah, well it would be if the hard working part was really hard working. MC use his common knowledge of his exterminator job, to wipe out groups of monsters (using a small monster he killed with poison to kill bigger monster who got posion by the poison meat of the small monster and die). Now he does it with not just one... more>> little monster, but a lot, a great lot. And for every "bigger" monster kill by eating the "small" monster which died by poison MC got EXP, and level up fast, like very fast, like in 3 months without getting out of town and killing a single monster in battle, his level is superior to the last hero who killed the demon king 300 years ago. In a few days he got from Level 1 in pharmacolocy to 5, shocking the 800 elf who spend lot and lot of years to get to level 5. So, the MC doesn't even try hard, he just put stats points to progress. (but he IS dilligent when he is making stuff). MC, is not interested in money, glory, and fighting, only discovering the world. Now that would be good if the side characters weren't so bland. So we got a bland MC, bland side characters, and no sign of character development. Every girl MC met and has a name is interested in MC but MC isn't. There is some talk about if MC or Side Character need relief thant they would do IT but nothing happen. At chapter 25 I'd say this novel is boring. It doesn't make you want to know what happen next.. I like this story. Easy to read. The MC is not into violence. Find different ways to handle what would be battle events. I am curious if someone as creative will try to capture him. Though he’s very smart the complexity might increase as the story continues. I feel this story can bring a different pace to the usual battle grind novels. I would like to read more of it. As you can imagine by the amount of releases (8 at the moment of this review), there isn't much to go on about, so I'll keep it simple. tl;dr : Might be worth a shot if you enjoy slice-of-life with a good pacing. For now, the story seems to go along fine. Although I feel like there's a prologue chapter missing. So, for the first few chapters (3-4), one might feel somewhat lost, as there was little effort made into introducing the environment before we are thrust into the plot (not "plot" mind you). The pacing is still a little unstable, it feels like the author is going for a fast-paced slice of life, but sometime the author goes slightly too fast. Similarly, it feels like the author is skimping a bit on the world building, but I'm under the impression that this will be fixed in a few chapters, which is nice as I don't personally enjoy the obligatory info-dump chapters that most authors put right at the beginning of the novel, it makes me more invested in the work before having to process a lot of information. it is still to early to talk about the relations between characters, which is the core of a good slice of life. However, the signs have been good until now: nobody fell in love with the MC so far and, going by the style, it seems if someone does fall in love, it won't be without a reason. On the MC side, there are no telltale signs of a dense protagonist (also good). Finally, the interactions so far are nice, specially the slaves. Although we hadn't had time to see any relevant character development, there were a few well-put foreshadows. The quality is good. Few mistakes and weirdly worded sentences are not frequent. Most importantly, it is easy to understand what is going on, which is (for me) the sign of a good translation. The translator seems to be going for 2-3 releases per week, which is a good pace. MC that angry as he need, realistically cool headed like some wise oldman take vacation doing business. The companion changes all the time as he cherish encounter but never try to keep any deeper relationship more than just a friend or colleagues. If you're looking for great action or very clever MC with plenty sceming etc. Go look elsewhere. This novel are for people who appreciate slow live and enjoying encounter as the smooth slice of life happen on scene. It's a super my pace kind of story. Mostly slice of life with him just wandering around solving pest problems and getting stronger because most of the pests are monsters. Though the latest plot point is God told him to exterminate some heroes because the spirits are making too many of them. So he's on a hero-pest killing mission now. He's not even searching for them so he'll probably just defeat them when they come to him. Unlike other Japanese novels that I had read, this novel was more carefree and yet with a tone of corruptions and chaos in the background. I don't know if this was just my imagination or not but as of now, at chapter 22, there is a couple of foreshadowing that I'd noticed. Similar to Death March but without all the "Harem-Style" MC. And if I was to recommended this novel then, Yes. Read it to chapter 10 or so to see if you guys and girls like it. After reading the first few chapters of the manga I was hooked and wanted to read it's source material the WN. The MC is hopelessly OP which wouldn't really be that much of a problem if the rest was funny but after a little while the support characters reactions towards him simply become repetitive as hell. I like the idea that the MC is planning on discovering the world at least. A good example of a story where the MC ends up in a harem heaven, but quite literally just wants to do his work and live a nice life. You might think of this as a boring setup, but this story manages to make really good use of the typically absurd isekai side characters and the MC seems like a rather smart guy who goes with the flow without getting absorbed by it. This story contains an OP main character to keep it funny and light-hearted, enough fantasy material to keep... more>> your imagination running, enough women and suggestive material to keep your imagination running in a different way, enough action to make the world seem active and enough travelling to make it seem like the story goes somewhere. Yet none of these things are exaggerated and the author knows how to cut a joke that's getting too old. Also, most of the characters (with a few comical relief exceptions) are rather mature and the typical "oh I'm 30 or so years but I act like the 14 y/o kid I am" isekai plague is avoided. A lazy exterminator who doesnt want to do adventurer's work has to be efficient and smart to work less and live lazily. The strongest slow travel life of a lazy bum who doesnt want to keep any slave for long. He got slave? He release! Current slave: a head maid with the disposition of a Slave. Release slaves: a potential magician who get sponsored into magic school in Capital, and a beastman who get sponsored into a gravekeeper for the starting town. I enjoyed the read so far but the set up has a massive exploit. When the main character 1st gets his masssive level up it is because of a chain of poisoning’s he caused. Following that logic wouldn’t creating a plague be the best way to level up? Or possibly poisoning the town well?